The Samsung Galaxy S2 is a great device, with which I’m really full and satisfied. What I can’t say of Samsung’s software called Kies, which serves to synchronize and manage the Galaxy S2 with your PC. 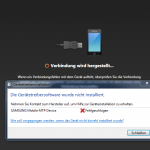 There are always problems in connecting the smartphone to the PC or in special with Kies. If one is affected by the problem and googling a bit, so you will quickly find out that this problem does not occur only sporadically. Therefore, today I want to show you three approaches that have helped me several times already when my Galaxy S2 won’t connect with Kies.